GLS Austria is one of the leading parcel carriers in Austria. Whether it comes to national and international delivery, the focus lies on high quality and our customers’ needs. Numerous optional additional services and modern IT solutions make collaboration with GLS simple, secure and convenient. One-stop parcel and express services – GLS Austria provides reliable delivery services to companies and individuals. High quality and a strong customer orientation are the service focal points. Express delivery throughout Austria: parcels arrive at their destination no later than 17.00 on the next working day. GLS Austria offers high-quality parcel and express services for national delivery within Austria and international delivery throughout Europe. A dense, modern depot network ensures that delivery is fast and reliable. In Austria, GLS has more than 630 GLS ParcelShops to easily hand over and collect parcels. In addition, GLS Austria is optimally integrated into GLS’s Europe-wide network. The parcel service provider has expanded its direct services to Eastern Europe and reaches Hungary, the Czech Republic and Slovakia from the Vienna area in just 24 hours. GLS Austria - founded in 1992 as "General Parcel Austria" - is one of the three major parcel carriers in Austria. Constantly low loss ratios, high quality standards and a strong customer orientation are its distinguishing characteristics. 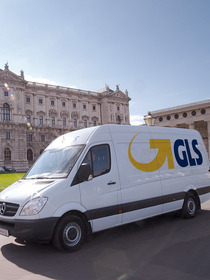 Besides parcel delivery in Austria and abroad, express services is also form part of its portfolio – integrated into the national GLS parcel network. Products can be combined with optional services according to the needs of senders and receivers.